Those who had the beautiful fortune of meeting Dadiji know clearly that Dadiji is a treasure-store of specialities. Just like Sakar Baba, one of the most striking qualities of Dadiji is her vast, ocean-like heart and the pure love she has for Baba, the yagya, Brahmin family and all of humanity. I began residing in Pandav Bhawan in 1974, then on Dadiji became instrument to help me progress in my spiritual life. There were many times when Dadiji entrusted me with responsibility for a new task. As I was fairly new, I would not be sure what to do and so I would openly tell Dadiji, “Dadi, you have given me this task but I don’t know how to carry it out”. Dadiji would reply, “Baba and Dadi have faith in you and know you will be able to do it”. Dadi’s faith was the guiding force through which I developed arts and skills on the service field. Beside other services, I was given duty of arranging accommodation for our foreign students and guests. Dadiji would love to invite souls to Madhuban but there were times when accommodation would get filled up, and there wouldn’t be space for foreigners or guests. I once had asked Dadiji, “There isn’t suitable space here so why are more guests being invited?” Dadiji’s reply was, “This is Baba’s home, things are possible, just big-heart is required”. With adjustment and re-arranging, everyone used to settle down comfortably. There were several times when Dadiji herself would personally see that the halls were properly set up. Dadiji never ordered anyone to carry out a task but would always initiate it herself, begin the task and inspire others to cooperate. When Om Shanti Bhawan was being built in 1982-83, the entire rocky mountain area had to be cleared which was a huge and difficult task. Dadiji would often visit the site to build up everyone’s enthusiasm and dedication towards the project. Apart from being excellent in spiritual knowledge and yoga, Dadiji was always interested in sports and entertaining activities. Dadi knew the importance of leading a balanced life and paid attention to keeping the body fit as well. Despite her age, Dadi was active and believed that we have to keep both mind and body healthy. Dadi would play badminton and even cricket at times. Dadi would often make programmes for all of us to go to Peace Park to play games and engage in other recreational activities. Dadi was very spontaneous in planning such outing. Not only would Dadi join us in the games, but she made sure everyone was present and participating as well. Dadi’s enthusiasm was always on a high. We once held a Sports Competition of the Niwasis in Peace Park and Dadiji motivated everyone to participate in any game. Dadi spent so many hours with us on that day ensuring that everyone had a good time. Dadiji also taught us to enjoy the beauty of nature in every season; she would sweetly remind us to become rivers of knowledge, ever-flowing to quench the spiritually-thirsty souls. During monsoon season, Dadiji would call us all of a sudden and tell us to get ready as we were going on a picnic to see the waterfalls etc. It would be a beautiful feeling of togetherness and family love. Dadiji never saw herself as an ‘administrator’. She always considered the yagya to be foremost a family. Before beginning any task or assignment, Dadiji would first invite the main coordinators of the concerned departments for a meeting. She would present the whole task before them and take their opinions and suggestions. Having considered all aspects and hearing everyone’s thoughts, Dadiji would go ahead with the best decision. Despite being senior in age and position, Dadiji remained ever-light with her juniors. Dadiji understood everyone’s specialities and distributed the service accordingly. Dadiji felt it was important that everyone was involved and no one was left out. I am very grateful to Dadiji for having taught me the art of communication. Her system of being clear with service companions was really phenomenal. Dadiji would directly communicate with instruments who were involved in a particular service, give them directions and then follow up to see that everything was going smoothly. This is the reason why every project became successful under Dadiji’s guidance. Dadi never said, “Dadi has done this and that” – Dadiji always said, “It’s Baba’s wonder, and He is doing everything”. Living in Pandav Bhawan for so many decades, I was able to receive perfect training from Dadiji. The faith she had in juniors enabled them to grow and improve. Dadiji never kept anyone’s weaknesses in mind, but always merged situations like an ocean and forgave souls if they realized their mistakes. Dadiji respected and looked after everyone – whether elderly or young, senior or junior, cleaners/labourers or VIP guests. Dadi’s heart was so clean and clear that it could merge anyone in it. There was a time when I had slight pain in my arm; when Dadi heard about this, she instantly took out the sweater she was wearing and made me wear it! She could really tap into the hearts of juniors. Her loving behavior was so heart-warming and filled my eyes with tears of love. Dadi was always concerned about welfare of anyone coming or living in Baba’s home or centres. She would also ask about the workers, maids and cleaners, see that they were all right. Dadiji taught me that when our thoughts and mind are clean and clear we can have powerful yoga with Baba, secondly come closer to the seniors and thirdly, experience Baba’s canopy of protection constantly. I never thought or expected I would be doing service so closely with the Dadis or senior instruments, but Dadi’s powerful vision and her faith in me helped developed faith in myself and Brahmin life. I remain ever-grateful to Dadiji for nurturing me so lovingly. Dadiji’s far-sightedness and nature of being unlimited in vision, attitude and service was the main reason how service expanded not only in Madhuban, but Bharat and abroad also. A Mind that never minds, a Heart that never hurts & a Relationship that never ends…thy name is Dadi Prakashmani ji. Ask your heart, “Do I have pure and good wishes for everyone?” For Dadiji answer has to be, “YES, for today and forever”. Rajyogini Brahma Kumari Dadi Dr. Prakashmani is a Jewel among the Spiritually Enlightened. Born in Hyderabad Sind (now in Pakistan), Dadi’s childhood name was Rama. Her father, a renowned astrologer of Sind could foresee his daughter’s destiny to lead an ascetic and chaste spiritual life in the service of mankind. In 1937, at the time of the establishment of the organization, in the name of Om Mandali in Sind, Kumari Rama – aged 14, joined the organization and dedicated her life for the spiritual upliftment of humanity. She was chosen as one of its original eight trustees and was given the divine name Prakashmani – meaning the jewel of light. After the institution’s founding father Prajapita Brahma left his mortal body in 1969, she became its Chief Administrative Head and was endearingly called as Dadiji. With generosity of spirit and unlimited vision as her prime movers, she has been able to lead and nurture the organization by leaps and bounds since then. 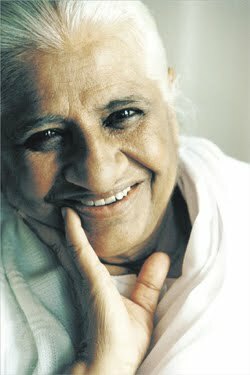 Dadiji was an immensely practical woman who in her 38 years as Administrative Head of the Brahma Kumaris, oversaw the opening of 4,000 centres throughout the world. A meditation centre has opened every 3 days – looks fiction but its fact. Whenever people pointed to Dadiji as the leader she would point her finger upwards. She was the ‘Server Leader’. When asked once how many followers she had, she would refute the idea, saying that Raj Yoga students are all becoming leaders…Her leadership was based on humility. Dadi Prakashmani was the embodiment of love, love & love, unconditional and genuine love. She loved freely and openly all who came in front of her, without a trace of attachment. She did not discriminate on any superficial grounds such as position, power or personality. The love that came from Dadiji’s eyes would flow freely, fill the soul, healing us and making us complete. Sweet memories of Dadiji will always be in our hearts and on screen of our mind. We will cherish each moment experienced in her divine presence. Once our sister took us to meet Dadiji, it was a noon time. She was reading / revising Murali. After introduction she looked at me and said, “Aapko kuch chahiye?” Do you need anything? I said “Dadiji we have received everything we wanted, now we look forward for your loving company and drishti. Her smile was simply angelic. At that moment she may not be able to recollect sister’s name who accompanied us. So, tactfully she asked us do you know her? Tell me what’s her name? Now it was our turn to smile, experiencing her simplicity & innocence. During Baba milan Dadiji will open her hands and fold them near her heart, as if she is merging all of us with love. Every soul felt elevated and touched by her simple gesture with love & care. Even during wing’s programme she will ask the audience “Are you all comfortable, please let me know if you require any thing” Thus not only BK souls but guests also felt as if she was there mother. One guest commented “the love I have received if past 3 days from Dadiji, I have never got from my own mother.” I am sure many more souls must have felt the same way. Dadiji won the heart of everyone, both in the organisation and whomsoever she came into contact with through her sweetness, simplicity, humility and a loving respect for each and every soul. Dadiji always treated everyone as her friend and spiritual sister and brother. Dadiji’s main concerns have been to promote the development of women’s potential within society, creating opportunity for young people, researching the hidden resources of the mind, transforming consciousness through meditation, reactivating moral and humanitarian values and working to bring unity among people for world peace. Dadiji was being treated at Mumbai BSES MG Hospital managed by Brahmakumaris during her last years. In spite of several medical instruments attached to her body and heavy medical treatment she never complained of pain. Instead she will ask the Doctor “How are you today? Are you OK? She had reached her complete stage and became true Angel. Our most beloved Dadi Prakashmani, left her mortal body on 25th August 2007 in Shantivan, Abu Road, India. Thousands of brothers and sisters & dignitaries from all over India and around the world had gathered at Abu road to pay their respects. The atmosphere was charged with divine meditation and contemplative silence; even five elements of nature were paying their respects to a true jewel of mankind.